Christmas and New Year is a great time to crack open a variety of different wines. With more people about the place you can share more and if everyone has a little glass you can try a few different wines with different foods, or just with different moods. 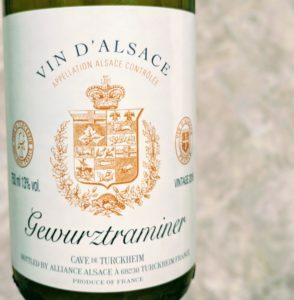 I’m a fan of Gewurztraminer even if I’m not a huge fan of saying or spelling it. It’s a tricky one to match to things though. the traditional picks are Indian or Chinese food, but I find both go much better with beers. This time around I picked it to go with some cold appetizers, smoked salmon and olives. I’m here to congratulate myself on my choice. I’d usually have gone for an Amontillado sherry as a pick, but I didn’t have any in the house and I was with people who are foolish enough to think they don’t like sherry. This ’16 wine which frankly could have come from any retailer, Cave de Turckheim white label for all and sundry, did in fact come from Waitrose. You can get it from Laithwaites too, or Virgin Wines, with slightly different labeling. It was a warm golden lemon colour with a visible viscosity on the legs. It smelled spicy and warm, although it was cold straight from the refrigerator. There was tropical fruits and warming spices. The immediate impression was of sweetness from the fruit, but a quick check of the front of my tongue revealed little residual sugar. The acidity was medium. The fruit was fresh and oriental with the characteristic lychee flavour smack bang in the middle, but with some florality following through, more Turkish Delight than actual roses, but pleasantly so. There was cinnamon floating in behind along with a mix of spices that hinted at mulled wine. The mouth feel was medium, as was the alcohol level. The little parade of fruits followed by spices kept the flavour rolling for quite a while. At about £10, but in this case £8 with 25% off six at Waitrose this was a good buy.